Goodness gracious, nobody told me what the last day of school can be like. Julian was in kindergarten for two years and the last day was a non-event, perhaps because we missed it for both years? The first for camping? Details are fuzzy. 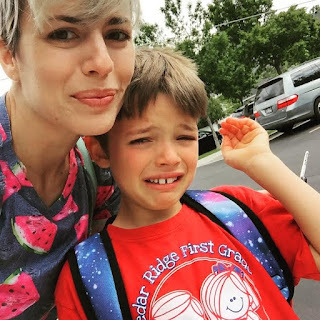 Last year we missed the whole last week (and therefore all of the "picnics" and "graduations" and "special activities"--best decision i ever made) and also, maybe because it's kindergarten? Maybe? But first grade is veeeery different, as we all know. I don't know about you, and maybe you're still in it, but for us, the last week of school was never.ending. Man alive! Every day felt like Friday. "Certainly it must be Friday NOW..." Sooo sloowwwww. I knew Julian was feeling some trepidation for one reason and one reason only: having to say goodbye to his dear teacher. Turns out Mrs. R was universally beloved. It wasn't the number of children who loved her (which was every one I talked to) but the way they loved her. Like, at the mention of her name, there was a certain look in their eyes, their expression immediately changed, softened, for fondness. Tenderness. She had carved herself a permanent place in each little 7-year-old heart and it was truly a thing to behold. Every now and then, throughout the year, Julian would randomly say things to me like, "You know. I think Mrs. R is really starting to become part of my life." It was unlike anything I'd ever seen, that's all i can really say about it. I felt like I was witnessing true love. True first grade teacher love-- just how it should be. Based on that alone I shall sing her praises forevermore with the utmost gratitude. Today is the last day of first grade. I didn't think it would be that big of deal. not as big as the first day, right? Wrong. We walked to school together and the air was thick with last day jitters and excitement. "Last day! I can't believe it! Finally!" we exclaimed, over and over. We said goodbye and that was that. Then it was time for pick-up. As I stood outside the school, waiting for you, I could feel some emotions bubbling up my throat (ew). I saw a big receiving line of parents with cameras at the ready, just outside the main doors. I stood back on my little patch of cement where I always go for pick-up and thought maybe I should get my camera out too and capture the "last day of school" faces. But of course I thought better of it, knowing that in so doing, I take myself out of the moment, and it did feel like a big moment. So I stood and waited and when the bell rang, an enormous mass cheer could be heard from inside and the kids started pouring out. I won't cry, I said to myself. That's silly. Why would I cry? So I took a breath and held it together and I was fine. And then I saw you. Like so many times before, I observed your face, trying to ascertain your emotional state. Today it was a bit somber and strained as you desperately tried to just get to me. And as you ran into my arms, you burst into tears, completely overcome by the emotions-- of the day and the beautiful heartache of loving a teacher so much and having to say goodbye. And so of course I cried, knowing perfectly well it is NOT silly. And we walked away together and I laugh-cried through your gut-wrenching tears, and that was the last day of first grade. "I just want the end of the school year to be pushed back farther, or not happen at all!" "I want to go to school for the rest of my life!" "I'll never make it through the summer!" "I'll never see Mrs. R again!" "This has been the most wonderful year! 100's club, parties, field trips... Second grade won't be the same!" "Mrs. R became such a part of my life. First she teached us and then we had to say goodbye. I miss her so much already." Honestly I'm getting a little teary just transcribing here. What a thing! Why did no one tell me? I assumed he'd run out, kicking his heels and never look back. But then, I did know the kid loves hard, loves deeply. We didn't give Mrs. R an end-of-year gift or anything, but I know she'll be receiving a mid-summer love letter with some pretty great quotes and maybe a school pic I have no idea what she'd do with. I was laughing more than this pic lets on, but man, we just feel what we feel! And we cannot hide. Also, I just spotted this touching little story.